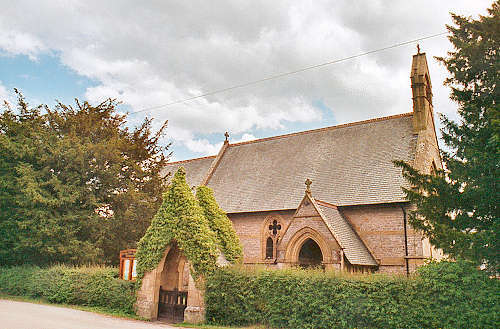 The foundation stone of St. John's church was laid on 1 August 1861, and the church was consecrated on 17 September 1864. The parish of Rhydymwyn was created on 31 March 1865. It comprised parts of the townships of Gwysaney and Gwernaffield, formerly in the parish of Mold; parts of the townships of Cefn and Glust (or Llysdianhunedd), and the whole of the township of Dolfechlas, formerly in the parish of Cilcain; and part of the township of Caerfallwch, formerly in the parish of Northop. For family history information about the church and parish, visit the GenUKI Rhydymwyn page.